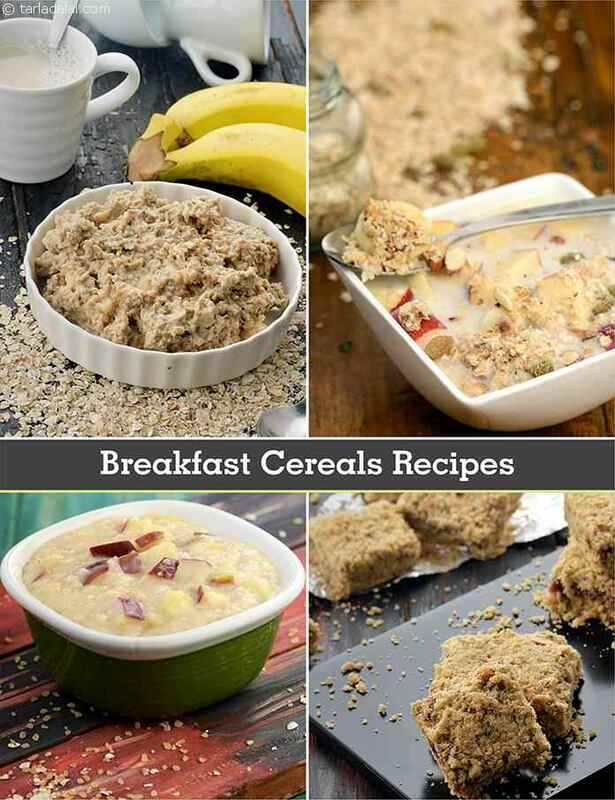 Breakfast Cereal Recipes, Veg healthy Breakfast Cereal Recipes. Cereals are a busy person’s best friend! Healthy and tasty, they are so quick too. You just need to spoon out some cereals into a bowl, drown it in low-fat milk or yoghurt, top it with some nuts and fruits, and voila, a wholesome breakfast is ready! You can prepare these Breakfast Cereals at home when you are free and store them in airtight containers. Why Oats as the healthiest breakfast cereal to use? The banana nut oatmeal recipe is a cmplete breakfast by itself. Here, we have cooked the oats, sweetened it naturally with honey and perked it up with crunchy almonds and the much-loved banana. The blend of fruity and nutty notes assures great taste and texture! Oatmeal almond milk with apples is the perfect recipes for vegans. We have used dates and apples as the sweetener. Can you think of anything simpler than adding all the ingredients to a jar, mixing and refrigerating? With the amazing mouth-feel of chia seeds, the nutty taste of oats and almond milk, the rustic sweetness of dates, a joyful tinge of peanut butter and the fruity pleasure of apples, this is one truly amazing and healthy breakfast. Use almond milk in your breakfast cereals. See why below. Almonds (badam) : Almond milk is made from 100% almonds plus water. Almonds are rich in B complex vitamins such as Vitamin B1, Thiamine, Vitamin B3, Niacin and Folate which plays an important role in the brain development. Almonds balances your cholesterol levels. almonds have a very low glycemic index and good for diabetics. See all 13 super health benefits of almonds. What a super combo. Oatmeal almond milk with oranges is a meal-in-a-jar that is unbelievably easy to make but exceptionally nutritious too! All you need to do is put all the ingredients into a jar, give it a shake and stow it into the fridge. After it sits there for a few hours, it sets beautifully and becomes a satiating and super tasty breakfast. Enjoy our Breakfast Cereal Recipes, Veg healthy Breakfast Cereal Recipes and other Breakfast Recipe articles below. Easily put together ingredients in this powerhouse muesli make for a low-cal filling breakfast. Packed with nutrients and fibre, this filling breakfast will surely keep you away from bingeing on unnecessary calorie laden food.